Vedanta Resources chairman Anil Agrawal hopes of a new chapter for entrepreneurship in India under Modi’s leadership. 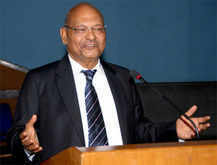 MUMBAI: Anil Agarwal, chairman of Rs 78,000-crore ($13 billion) Vedanta Resources, like a lot of Indian businessmen, has been extremely pessimistic about the Indian business climate for a while now. But the decisive victory for the BJP in the recent elections has wiped most concerns and he is confident that Modi’s leadership will write a new chapter for entrepreneurship in the country. The London-based billionaire, who started his career as a scrap dealer in Patna, now has global interests in oil, iron ore, copper, zinc, bauxite and aluminium. Particularly critical of environmental NGOs, he echoed the Intelligence Bureau’s concerns on their role as economic terrorists and expressed confidence that once all his stuck projects start operating, he alone would be able to contribute 1% to the country’s GDP. On a whirlwind trip to Mumbai, Agarwal spoke to TOI on his new-found confidence and the policy imperatives that the government should drive to attract what he described was about $3 trillion worth of idle cash which companies in the US are looking to invest. Excerpts. You met Prime Minister Narendra Modi recently. What did you talk about? What are your expectations from the new government on the policy front? It was just a courtesy meeting. We expect things will change and decisions will be taken. Investments will start pouring in once we are ready with a policy. The key priorities should be poverty alleviation, job creation and infrastructure development. US corporations have $3 trillion of funds lying idle with them and they are looking to invest. Even if we get 10% of it, we will be blessed. The government must keep its policies simple, stable and long term. Many of your big projects were stuck under the last government. With the new government in place and the sentiment improving, will you now invest in India? We produce oil, iron ore, copper, zinc, and aluminium; if we get approvals to produce all of them to our full capacity, we will contribute about 1% to the Indian GDP. We can double our oil production to 4,00,000 barrels per day (bpd) if we are given clearances to invest another $3 billion. Cairn India alone can give the government Rs 1,00,000 crore of revenues if the approvals come by. Similarly, we can double our iron ore and production and quadruple the production of aluminium and bauxite. You have to give me confidence that you are going to produce for 20 years so invest $5 billion. Can you believe that we have invested over Rs 60,000 crore in Orissa creating one lakh jobs and we are just operating at 25% capacity. However, I am confident that we will be allowed to operate at 100%. You participated in the disinvestment of the government in the last NDA regime and acquired Hindustan Zinc & Balco. What is your strategy to bid for the balance stake in these two companies and other opportunities in disinvestment that may come up? We are keen on opportunities coming up through disinvestment as also to acquire the balance stake in both HZL and Balco as we have created substantial value in them. The government’s 29% stake in HZL valued at Rs 500 crore then is now valued at Rs 20,000 crore. I have always said democratic countries don’t have any government company, then why should the Indian government run a company? Just divest 51% and let people be the shareholders and elect a professional CEO to run the company. We don’t want these companies to be run by capitalists. Besides, to protect the interest of employees, they can be offered 5% shares. I can bet that once this is done, ONGC will become Exxon and SAIL will become Valle. If, ICICI and L&T can run, there is no reason why NTPC, ONGC, SAIL, BHEL and others cannot. Your shareholders are concerned with the slowing profitability and share prices. Besides, the green lobby is seen actively campaigning against Vedanta in India and the UK. Vedanta is celebrating 10 years of listing this year. It is the best performing share among natural resource companies in London. It has delivered total shareholder return of 200%, higher than the FTSE 100 and FTSE 350 Mining Index. During the decade, it has grown from a company with revenues of $1,290 million to $12.9 billion. As for the green lobby, fundamentally, who wants 1.2 billion people to produce their own? The “sahukars” (money lenders) would always want you to borrow money from them and the government has understood this. Have you put in a succession plan? Vedanta is beyond succession. It’s an institution. My daughter is working in the media space and son is working on process metals. Let the company grow professionally under CEO Tom Albanese. Besides, I am very keen to look after the company so I won’t force them to run it. They will be just shareholders.